Ask any parent who has kids in their terrible threes and they’ll tell you that those little critters can be quite a handful to contain, especially when you’re out in public trying to run your errands. Kids seem to have a penchant of running off by themselves the moment you take your eyes off them even for a moment, but with the Lost Me Find Me Child Alarms, your task of parenting gets a whole lot easier. Essentially these clever little gadgets are proximity detectors, with the transmitter hidden in a delightfully soft adjustable wrist-band that fits nicely round your child’s wrist. Mum and Dad keep hold of the alarm so when the little one goes exploring you can be alerted as soon as they wander out of range. You can set the approximate range (from 1-20 metres) at which point your alarm will go off, to warn you that your little terror has wandered out of the transmitter’s range. You can then switch your receiver to ‘Locate’ mode, and it will go off the moment you are back in range. Brilliant. Bear in mind that these are not meant to replace vigilant parenthood, but it does put your mind at peace even if for a while. 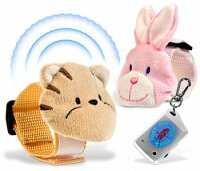 Either Rabbit or Tiger Wrist Alarms will cost £19.99.